Forging positive social networks is crucial for homeless people as they prepare to live independently. Studies on the effects of gardening on people’s welfare have shown significant reductions in depression and anxiety, improved social skills, and opportunities for vocational development. Increasing people’s exposure to green spaces has been linked to long term reductions in overall health problems and better self-rated mental health. Over the past year, residents from two homelessness schemes in Cambridge have taken part in a garden project. A core group of four or five people attends most sessions. Other residents come out to watch or join the group for tea. The group sowed, grew, and harvested a variety of vegetables which have been shared out and enjoyed by the members. They also made up small veggie stew starter packs for other residents of the hostels. Residents are encouraged to improve their health with cookery sessions which teach them to produce low cost, tasty and healthy meals. The group has made some big alterations to the site. They have developed a social space around a fire pit with a story telling chair; built a living-willow dome in the memorial garden; and done more sensory planting in the wildlife and memorial garden areas. A pond in the wildlife garden is finished and the group has started to landscape the area around it to encourage bio diversity. The project is constantly developing, with participants coming up with new and creative ideas. They aren’t just learning some very useful skills and knowledge. They are also gaining confidence and a sense of achievement, making friends, broadening their horizons, learning how to work as a team, and engaging more with the community. Every team member of a group project is important to the whole community. They each have their own story to tell and skills to bring to the team. Ed has been working on the garden project since he moved into hostel last summer. Ed is hoping to get his own place with his sons and get back into landscaping work. He has a story to tell from every part of his employment, whether it is farm work, delivering coffins, or factory line working. He puts this wide range of skills into practice at the project, using scrap wood and pallets to build anything they need. 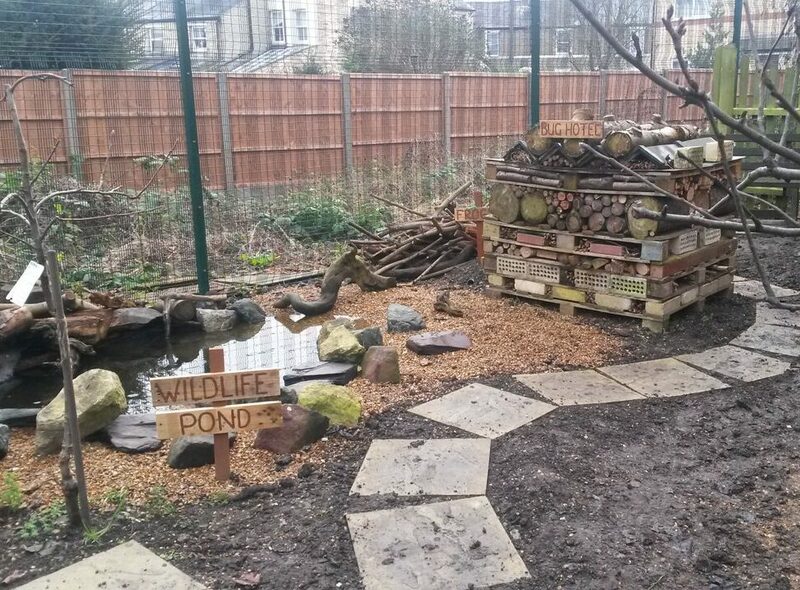 Items he has made include a bird palace, a new bench and archway, compost bays, fencing and edging for beds, and a ramp into wildlife pond area.